Carol Burnett celebrates, on its original soundstage, the 50th anniversary of THE CAROL BURNETT SHOW, her landmark comedy/variety series. Photo: Cliff Lipson/CBS ©2017 Broadcasting, Inc.
“There is a place for good fun that the whole family can watch.”– Carol Burnett. National treasure and doyenne of family friendly entertainment, comedienne Carol Burnett has actually made our nation laugh… guilt and partisan free …for more than 50 years. Her personal trophy shelf is host to a boatload of Emmys, People’s Choice Awards and Golden Globes, as well as the Horatio Alger Award, Peabody and Ace Awards, a Kennedy Center honor, the Mark Twain Prize for American Humor and a Presidential Medal of Freedom. An endless stream of personal tributes and guest appearances continue to attest to her legacy in broadcast history as a pioneer of sketch comedy. 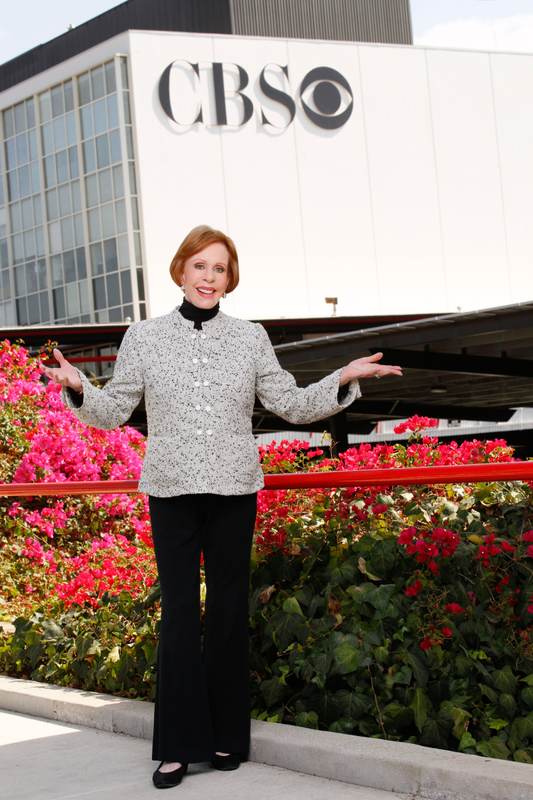 Although she has excelled on stage, film and TV, in both musical comedy and drama, her most unforgettable contribution to television and the entertainment industry as a whole is, of course, The Carol Burnett Show. 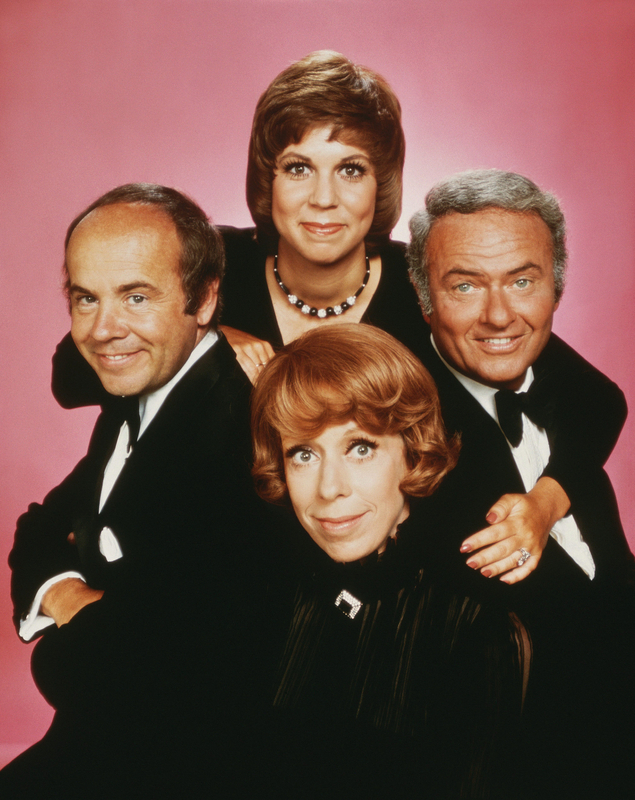 THE CAROL BURNETT SHOW featured the collaborative genius of (clockwise from left) Tim Conway, Vicki Lawrence, Harvey Korman and Carol Burnett. Photo: ©2017 CBS Broadcasting, Inc.
An hour-long comedy variety show, The Carol Burnett Show debuted on CBS on September 11, 1967, ran for 11 years, amassed 276 episodes, originated eight or nine individual comedy sketches per episode, averaged 30 million viewers per week and received 25 Emmy Awards. It was named by Time Magazine as one of the “100 Best Television Shows of All Time,” and continues to be a hit in reruns on MeTV and, in boxed sets, on DVD. TV audiences first became acquainted with Carol Burnett as a wildly inventive cast member of The Gary Moore Show on CBS. Although the concept of a woman hosting and driving her own TV variety series was inconceivable at the time, her savvy agent somehow orchestrated a clause in her contract that gave her the opportunity to host her own variety show. When she decided to test the waters and request her own variety show, Ms. Burnett was initially shot down by skeptical CBS brass. But thanks to that ironclad contract, CBS had no choice but to acquiesce. A star was born, and The Carol Burnett Show became must-see TV for generations of viewers and a ratings bonanza for CBS. 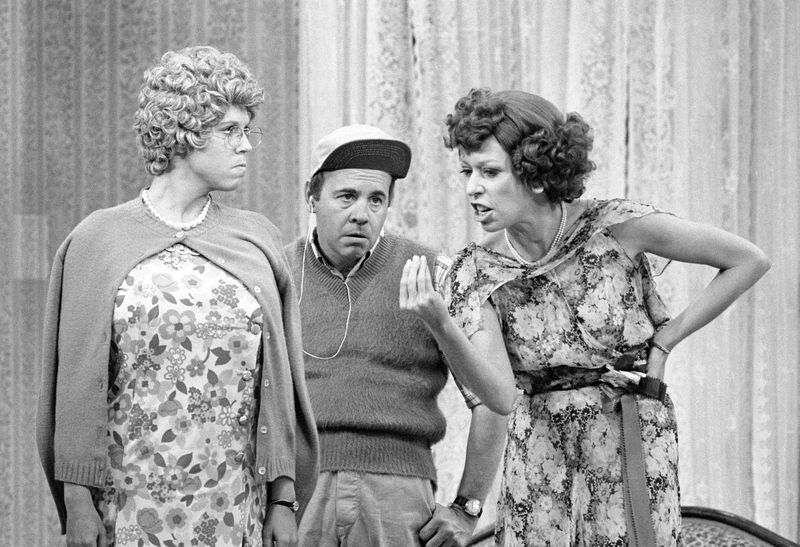 Vicki Lawrence, Tim Conway and Carol Burnett go for the laughs in a classic “Mama’s Family” sketch on THE CAROL BURNETT SHOW. Photo: CBS Broadcasting, Inc. All Rights Reserved. 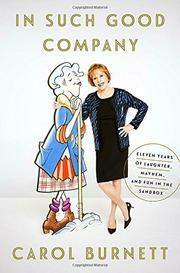 It’s clear from the clips featured on The Carol Burnett 50th Anniversary Special that her comic and collaborative genius made shows like “Saturday Night Live” possible. SNL alums Bill Hader, Maya Rudolph, Martin Short and Amy Poehler join Jay Leno, Bernadette Peters, Steve Martin, Steve Lawrence, Stephen Colbert, Kristen Chenoweth and Jane Lynch to pay homage to Carol Burnett’s trailblazing show. Anecdotes from Ms. Burnett and original cast members Vicki Lawrence and Lyle Waggoner drive the conversation and introduce memorable characters and clips from the show. Also featured is costume designer Bob Mackie, who was a pivotal player behind the scenes on The Carol Burnett Show. Starlet O’Hara, Nora Desmond, Mama, Eunice, Mrs. Wiggins and the rest of Carol, Vicki, Lyle, Tim Conway and Harvey Korman’s beloved characters found their footing (or lack of it) in Mackie’s brilliant costumes, some of which are now housed at The Smithsonian. This entry was posted in Books, TV and tagged Bob Mackie, Carol Burnett, Comedy and Comedians, Harvey Korman, In Such Good Company, Lyle Waggoner, The Carol Burnett Show, The Gary Moore Show, Tim Conway, TV Variety Shows, Vicki Lawrence. Bookmark the permalink. Your review as always is right on! Loved watching this wonderful show. I just set this show to record on our DVR and then a minute later got your blog post re the show. Should be great. Will read your post as soon as we get back from a film. Thanks!